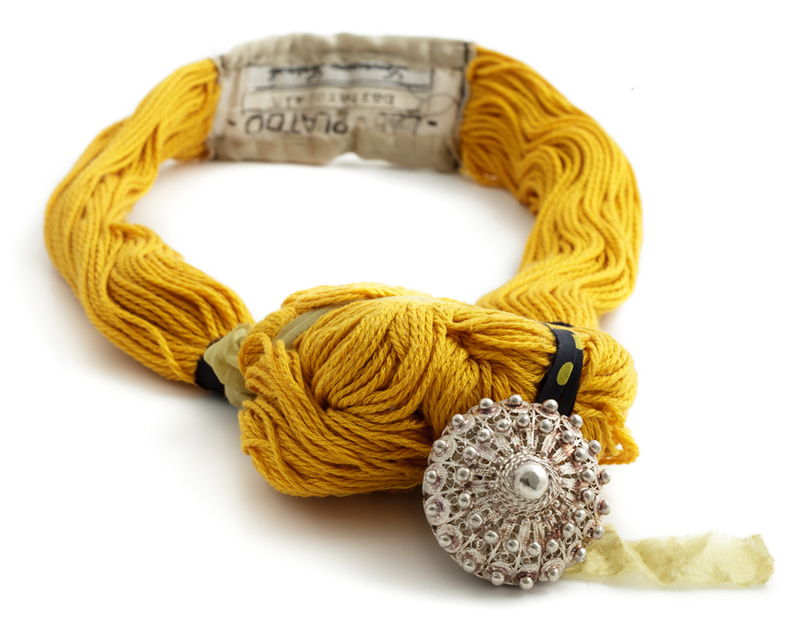 This textile necklace is made out of a small semi-worked cotton bundle, with a precious silver pendant consisting of a single traditional button. This combination of traditional and contemporary styles provides an original interpretation of ancient themes with an innovative approach. 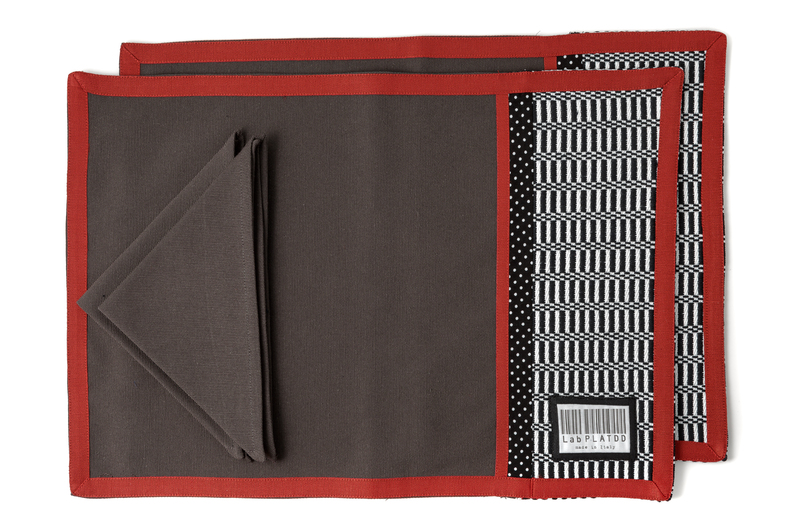 These practical contemporary American placemats with asymmetric composition are realised by combining, through the use of the patchwork technique, black and white fabrics with various other fabrics. 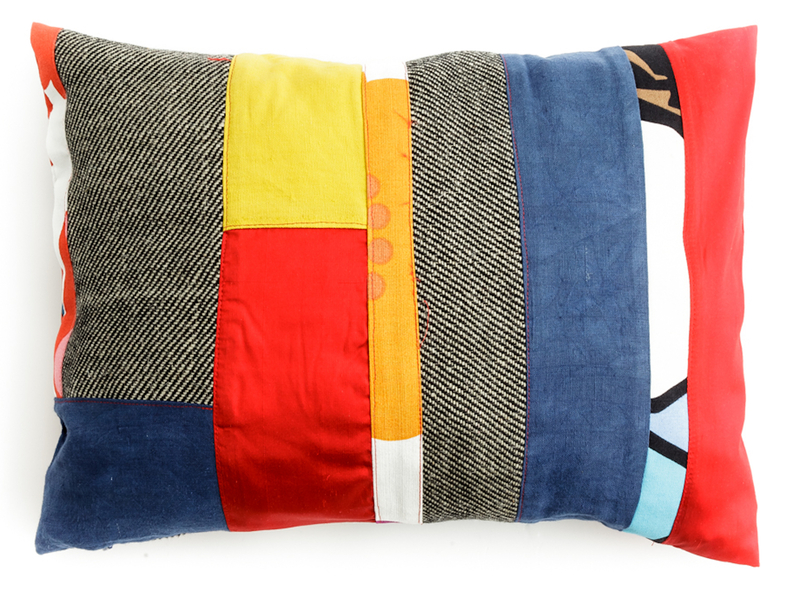 Cushions made of orbace, a traditional local wood fabric, and cotton clippings. Including a careful collection of precious pieces of rich fabrics, woven with mixed tailoring techniques, these cushions are part of a collection of home accessories crafted in limited edition. This small bag features a balanced combination of materials through the use of different techniques and an intentionally casual style. Careful combination of precious fabrics: leather, natural dyed cotton and orbace, a typical wool used in local textile production. 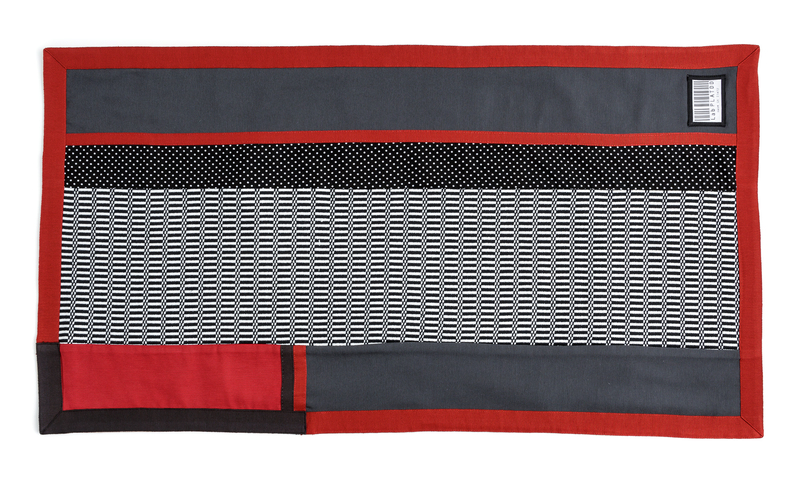 The prized geometric composition of this table runner is obtained by matching the patchwork technique of the traditional black and white saddlebags, bertule, with other fabrics in harmonious and suggestive asymmetry. Lab is an experimental project that combines dynamic design, fashion, and craft traditions. Created by Barbara Pala and Antonella Tedde, the former being a fashion designer and the latter a pattern maker, it is a creative workshop that focuses on the remake of traditional fabrics for the crafting of new intuitive and original objects. Barbara Pala studied in Milan and was awarded a scholarship to attend the Master's course in Fashion Design at Domus Academy. Later on, she carried out several projects and collaborations with haute couture professionals. Antonella Tedde studied in Florence as a pattern maker, attending a top quality training programme. She then gained experience and expertise during her years of activities, working for a large clothing company in Borgo San Lorenzo. Once back to Sardinia, after treading interesting individual paths, they decided to combine their passions and devote themselves to experimentation in the field of fashion design, with an innovative and distinctive approach. In their workshop, the two designers make tailor-made clothes and restyle vintage clothes, creating sophisticated and unconventional products. References to traditional crafts are combined with new design solutions, such as those applied to the series of original and exclusive textile jewels. Creativity and inspiration are shaped under new perspectives. Materials research, graphic design and tailoring technique are the basis of Lab textile production, characterized by unusual combinations of materials, fabrics and colors, with intuitive and high quality processes and technical solutions.